PETALING JAYA: Malaysian developers have their fair share of successes overseas and one of the most successful players in Australia is Mulpha International Bhd. Renowned for its A$2bil Sanctuary Cove development on Australia’s Gold Coast, Mulpha is today one of the largest Malaysian developers Down Under with an estimated asset portfolio of A$1bil. Its wholly-owned subsidiary, Mulpha Australia Ltd, has developed and managed a wide range of property and lifestyle assets, including hotels, a hotel school, integrated residential and commercial developments, car parks, and a winery and vineyard operation. Its assets include the Hyatt Regency Sanctuary Cove in Queensland, Hilton Melbourne Airport, InterContinental Sydney, The Hotel School Sydney, Norwest Business Park, 99 Macquire Street and Cathedral Street Car Park in Sydney, Bimbadgen Estate in New South Wales’ Hunter Valley, and the award-winning Hayman Great Barrier Reef. For the six months ended June 30, Mulpha Australia contributed 66.5% to the group’s revenue of RM357.9mil while its Malaysian business’ share was 7.5%. The balance of the revenue came from operations in China, Hong Kong, Singapore and Vietnam. Mulpha is now looking to build a stronger presence in the Klang Valley property market. General manager for property division Ronn Yong said that despite its successes in Australia, the company had not lost sight of its local roots and business interest. With its vast knowledge in building lifestyle homes, Mulpha is looking to introduce more innovative housing designs in Malaysia. “We are working towards expanding our presence in the Klang Valley and have lined up a few prime residential projects in Kuala Lumpur’s well sought-after addresses. By leveraging on our expertise as a niche lifestyle developer, we hope to contribute towards changing the local property landscape. “Malaysians are becoming more lifestyle-conscious and we are confident there is a big market for our range of high-end residences,” Yong told StarBiz. Mulpha, via property arm Mulpha Land Bhd, is planning a few exclusive project launches in the next one to two years. Major projects under Mulpha Land include Bangsar Enclave and Raintree Residence in Kuala Lumpur, Taman Desa Aman in Kedah and Bukit Punchor in Nibong Tebal. The most exclusive project will be Bangsar Enclave, to be unveiled early next year. The gated and guarded luxurious bungalow enclave, located at Jalan Medang Tanduk, will have a gross development value (GDV) of RM75mil. Located on 1.54 acres, there are only seven three-storey bungalows sharing a common communal linear garden, a courtyard and deck. Each of the contemporary, minimalist-designed unit, with built-up of 7,525-9,540 sq ft, will have its own private swimming pool, koi pond and lush garden. They are available at an average price of RM10mil. Yong said another upcoming project would be an eight-bungalow enclave in Jalan Langgak Tunku in Bukit Tunku. The residences will have land area of 15,000 sq ft and built-up of between 8,000 and 15,000 sq ft. 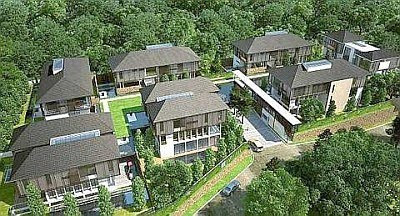 The lifestyle homes with indicative price of RM15mil each will be launched by early 2011. Mulpha is also undertaking the refurbishment of the Raintree Residence opposite the Raintree Club in Jalan Ampang. The luxurious low-rise residential building, with eight apartments and four penthouses, was purchased by Mulpha in 2002. Presently seven of the units are leased out at a monthly rental of RM4 per sq ft or about RM8,000 a unit. Yong said if the right buyer came along with the right offer for the building en bloc, “we may consider selling the property.” Otherwise, the residences will be kept for long-term leases. The group is also an active builder in Johor with its Leisure Farm Resort on 1,765 acres going full swing now. According to Yong, Leisure Farm is one of the first award-winning double-gated residential resort developments in Iskandar Malaysia with a 36-hole golf course and country club, a recreational club, canal park and organic orchard. It has attracted a lot of foreign interest, especially Singaporeans. Offerings at the RM2.6bil development include spa villas and chalet hotels along a canal. “We are in the process of planning resort lifestyle spa hotels in Leisure Farm to support our future retirement villages there. Phase one will include the expansion of the Bale Equestrian Club that will commence in the second quarter of next year while the phase two Spa & Village Hotel will start in 2011. Phase 3, comprising a cluster retirement village, will follow after that,” Yong said. Also in the pipeline are 332 semi-detached units and bungalows fronting the canal and mangrove reserve in Precinct 7, with a GDV of RM500mil. Mulpha is planning to build an office building, Menara Mulpha, along Jalan Sultan Ismail in Kuala Lumpur. Construction of the 29-storey Grade A office tower with a gross floor area of 360,000 sq ft will kick off in the second quarter of next year for completion in 2013. With a GDV of RM450mil, it will be designed by New York architect Kohn Pederson Fox. AUSTRALIA'S housing shortage provides good opportunity for those seeking to diversify their property investment portfolio overseas. Frasers Property Australia Pty Ltd managing director and chief executive offficer Dr Stanley S.H. Quek said the high immigration trend in Australia makes the country an attractive spot for property investment. Last year, 430,000 people migrated to Australia. "The lifestyle, stable economy and political situation make it an interesting country for people to live in. Many students who used to study in Australia also go back to work and settle down there," he told Business Times in an interview. According to an ANZ Australian Property Outlook report, house prices and rents in Australia will continue to skyrocket on the back of a record shortage of supply. "By 2010, we project a record housing shortage of nearly 200,000 homes," it said. Sydney has a population of 4.3 million and is set to grow by 25 per cent to 5.35 million people by 2026. The city has the highest dwelling of housing undersupply among other capitals, with an estimated lag of two years worth of building. 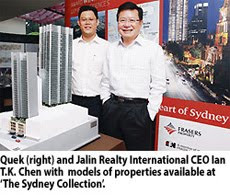 Over the weekend, Frasers Property Australia, in collaboration with Jalin Realty, had organised "The Sydney Collection" seminar, a preview of its residential properties in Sydney. It featured three types of apartment buildings and low-rise houses, with prices between A$435,000 and A$2.9 million (RM1.5 million and RM8.9 million) per unit. The properties include Lumiere Residence, encompassing 456 units of apartments, and a residential property called Trio. The government should give incentives for first-time house buyers, review its policy on low-cost housing and improve the approval process, says YTL Land & Development Bhd. These are some of the property developer's suggestions for the upcoming Budget 2010, which will be presented on Friday. Currently, there are no incentives for first-time buyers although the industry has lobbied for it since last year. Fiabci, an international real estate federation, has asked the government for grants of up to RM10,000. YTL Land executive director Datuk Yeoh Seok Kian also held the view that the government should examine what he termed as unhealthy competition in the high-end residential market. State firms like the Selangor State Development Corp (PKNS) are building houses priced at more than RM800,000 each. He argued that PKNS should stick to providing social housing instead of competing with the private sector. "This will certainly improve the overall well-being of deserving Malaysians faced with financial difficulties. A lot more can be provided for at the end of the day and the responsibility should not only fall on private developers," Yeoh told Business Times. Under current policy, 30 per cent of a developer's residential project must be low-cost housing. Yeoh also hopes that the government will improve the approval process for new development projects. "This is one of the challenges we continue to face. While the government has acknowledged this as an issue with the set-up of the One-Stop Centre (OSC) in 2007, there should be better follow-through to ensure all parties are working towards the same intent," he said. Yeoh said delays caused by unnecessary red tape and bureaucracy could be reduced with better enforcement and regulation. "Ongoing reviews of policies can play a major role in helping the property sector stay robust and competitive," he added. Environmental issues and climate change have marched into the mainstream of popular, political and business thinking over the last year worldwide. As individuals, corporations and governments alike take more cencerted action to help "Mother Earth", governments are often seen as the catalyst in spearheading this initiative by way of legislation. In the UK, for example, the introduction of the Climate Change Act 2008 has mapped out the direction of the government's policy. But what types of legislation are effective in initiating change, particularly among companies? * Businesses believe that tax incentives could be an important tool in encouraging a change in their behaviour and want to see the government offer more and better designed incentives. The survey findings clearly indicate that while governments must drive the initiative, they must also bear in mind the preference by businesses for "carrot" incentives over "stick" penalties in changing corporate behaviour. It is important that the incentive framework is not onerous or complex, lest it fails to motivate changes in behaviour. Moreover, the framework must be sufficiently potent to generate a multiplier impact on the change behaviour of the larger community. One area of focus is the building industry. Buildings alone account for nearly one-third of the energy used globally and, if appropriately incentivised, could create the impact we seek on environmental change behaviours. In Malaysia, our corporates are embracing green initiatives more keenly and an upshot of this is the proliferation of green buildings. The recent establishment of the Green Building Index (GBI) is a key milestone. Incentives such as higher plot ratio and better land premium rates to promote the development of green buildings are currently being explored. These are well and good, but if we are to look at the tax incentives for green buildings, we would find that they are scarce and not "potent" enough. Currently, the tax incentives are mainly geared towards spending on energy-efficient assets by way of investment tax allowance. It should also be noted that green building initiatives do not stop at just the installation of energy-efficient assets. It encompasses the way the building is designed and constructed, site planning, innovation and resources used. The building must be sustainable and can provide energy savings, water savings, a healthier indoor environment, better connectivity to public transport and the adoption of recycling as well as the greenery of the project. While it is true that, generally, adopting green thinking and technology would be costly and may not be attractive for building owners, especially if the return on investment is too long, injecting the right "carrots" to the right sectors should drive the green initiatives, notwithstanding the high investment or cost of moving towards green technology. The government's endorsement of green buildings in a more holistic manner will positively impact the developers, property owners, consumers and suppliers to think and act green. Granting greener tax incentives which are pegged to the type of building certifications such as the GBI or the likes will impact the entire building supply chain: from building owners and suppliers right up to consumers. Given the size of the property industry, incentives such as investment tax allowance or even industrial building allowances for green-certified buildings will be impactful. We don't need to look far for examples. Across the causeway, the Singapore government uses both the "stick" approach of requiring green certification for buildings and the "carrot" approach of incentives such as grants to building owners and accelerated tax depreciation for energy-efficient equipment. Australia also provides incentives such as interest-free "Green Loans", grants and rebates to encourage greener living. In Malaysia, using incentives as a tool to stimulate a change in behaviour will probably be preferred over the "stick" regulations. The introduction of regulations will likely give rise to a host of compliance issues before the community is ready or makes a conscious effort to go green. As a start, the government may want to invest with businesses to change behaviour in protecting Mother Earth. As the politican and environmentalist Peter Garrett said: "Climate change is such a huge issue that it requires strong, concerted, consistent and enduring action by governments." Peter Wee is an executive director at PricewaterhouseCoopers Taxation Services Sdn Bhd.